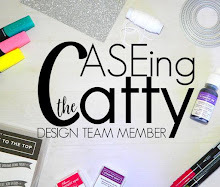 Hello and Welcome to our CASEING the CATTY Sunday blog hop. 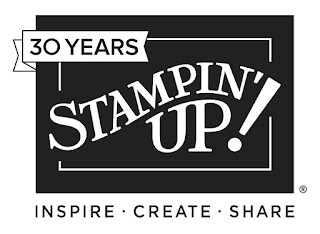 We are a design team focussing on the Stampin' Up! 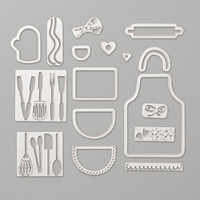 catalogue so you see the projects and ideas with new eyes every week. 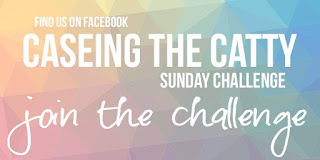 We Copy And Share Everything or Copy And Selectively Edit (CASE) from our catalogues every Sunday night and invite you to join in the fun too with our weekly challenge. This week, the challenge is all about the Best Route chapter - pages 52 - 65 in the Annual Catalogue. 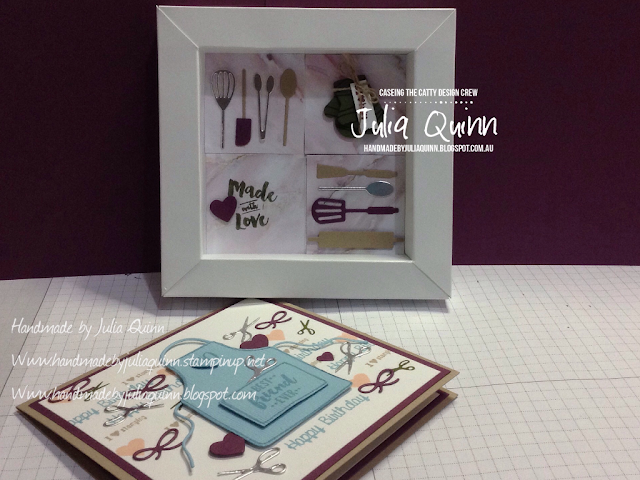 I took my inspiration from page 61 and the Apron of Love stamp set and coordinating framelits. 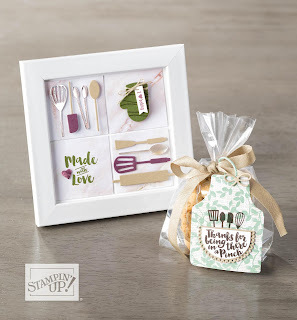 I love this frame and I'm totally in love with all those gorgeous utensils in this set!! 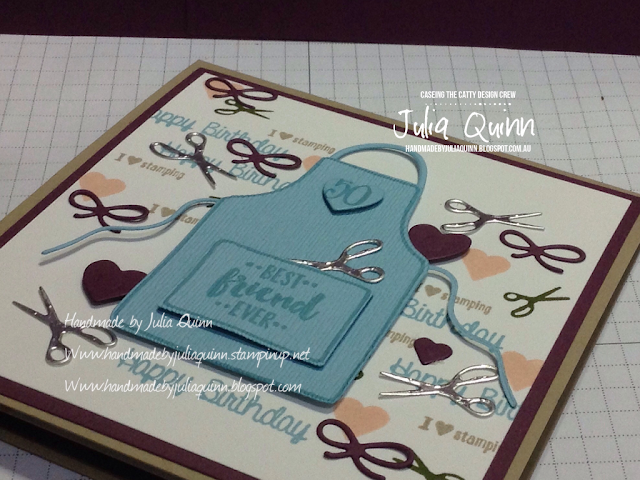 This little duo is a gift and coordinating card for my dear friend who turns 50 next week. Originally we were going to be together for her birthday, but we are no longer making the 10 hour drive to go camping with her now, so this will have to be posted. 3/4", 1 1/2", 2 1/4", 3", 8 1/2", 9 1/4", 10", & 10 3/4" on both sides. Each of the little pieces of the Petal Promenade DSP measures 2" x 2". 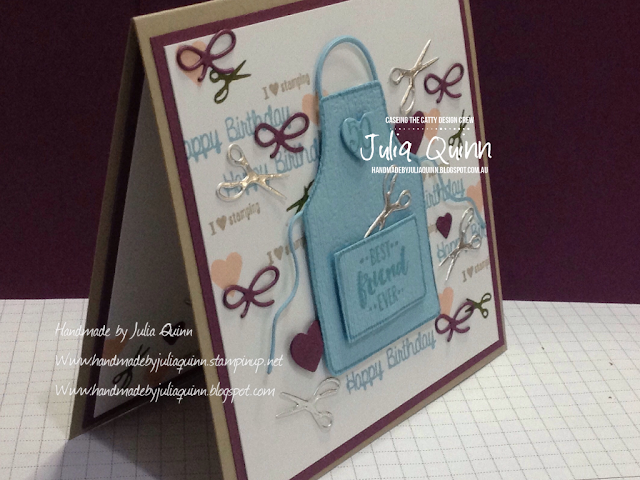 The card to accompany the gift was inspired by the lovely card pictured also on page 61. I've changed the size up to 5" x 5" to coordinate with the frame, but basically it's the same. The colours I've used are: Fresh Fig, Balmy Blue, Crumb Cake and a little Petal Pink for the hearts. I've also embossed the apron with the Subtle embossing folder to give it more texture - it now looks like a linen apron!! 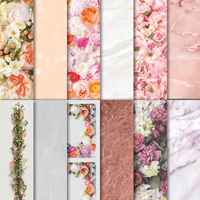 Every time we do this blog hop I'm amazed at the incredible inspiration from everyone on the design team, and I know you'll be inspired too. Next up is Peta's totally adorable giraffe. 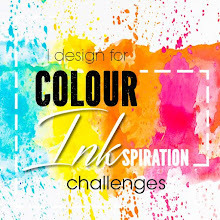 We love to share the fun of the challenge with you, so please grab your catalogue, check out pages 52 - 65 and get creating, then add your project to the lineup on our facebook challenge page. 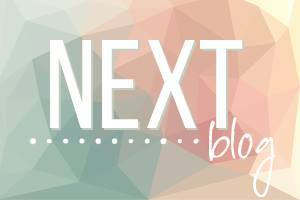 Promotions this month - woohoo!! 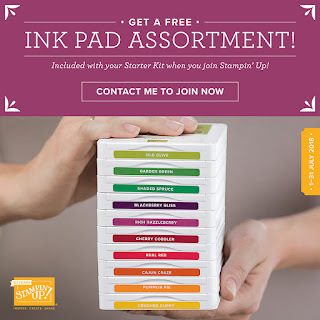 Join up and get 10 FREE inkpads!! 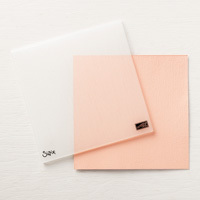 I love this idea, and you will too!! 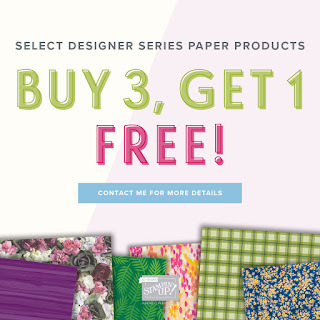 This month is the month to stock up on your DSP - you get FREE DSP when you buy 3 - what a wonderful way to get some more!!! 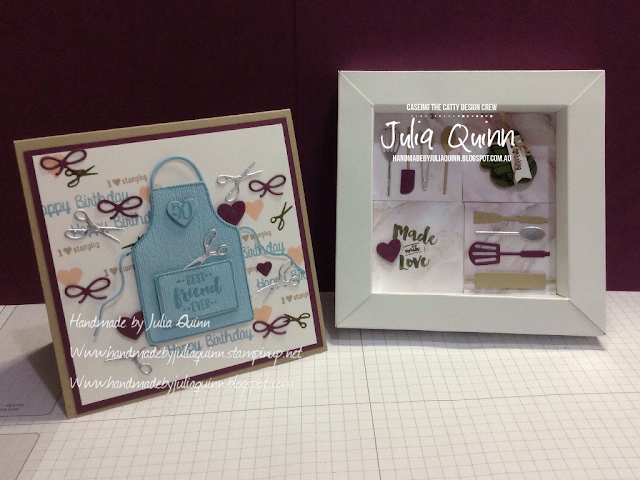 What a lovely gift, thanks for the details on how to make the shadow frame, so cute. 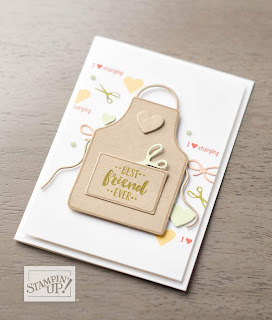 Your friend will be so happy with her gift! What a great frame. Wow, that's amazing. 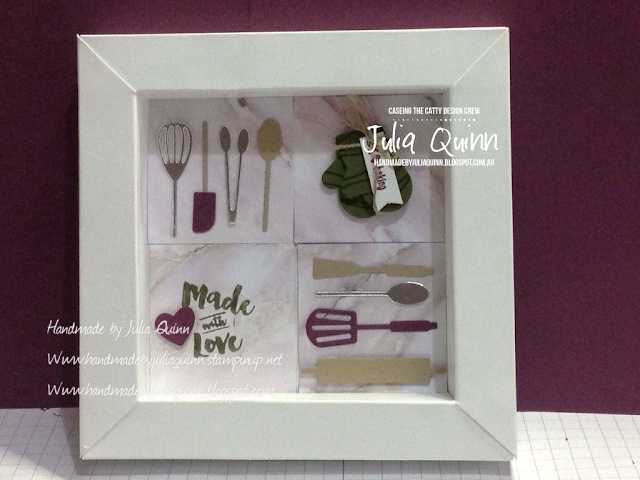 You'v done a great job creating that frame Julia, I admire anyone who can use all those little pieces. Your friend will love all the effort you have gone to, shame you won;t be able to give it to her in person. Thankyou Liz. Yes, it is a shame we won't get to cape hillsborough N P but we'll have a long chat on the phone! 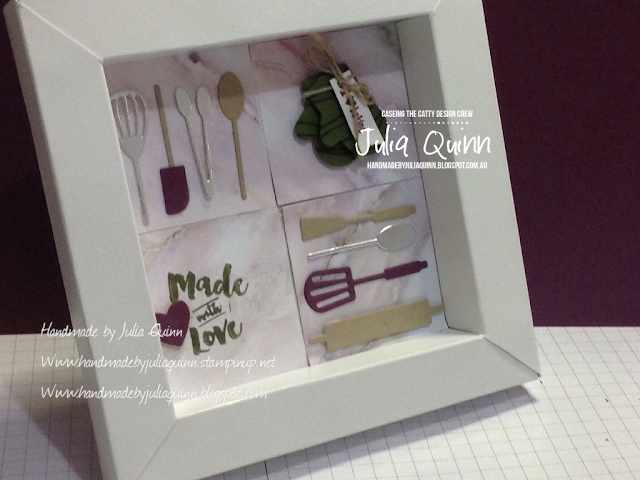 Julia, your shadow box and card are adorable. I love the linen look apron and all those little utensils are so cute. I'm sure your friend is going to love them. Thank you so much Peta. I love the linen apron too!! THank you Angela - fun gift idea! Thank you Kelly. 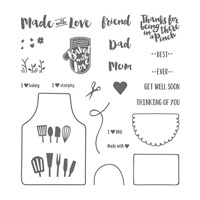 Love this bundle.